Those who follow this blog know I am a New York Yankees fan. Along with that comes plenty of chiding and condemnation about everything from the supposed “arrogance” of the players to the team ‘buying" championships with “endless” amounts of money. I don’t get that kind of reaction at all for being a fan of my favorite football team, the New York Jets. Perhaps it is because of their long-standing tradition of “close but no cigar” football. For some reason the Jets usually have some good elements but can’t seem to pull it all together. Most of the time, over the past 42 years, the Jets have had problems at the Quarterback position, as I pointed out last year in my post Six... no, scratch that... Sixteen degrees of Joe Namath. But Jets fans stay loyal, in large part, because of the true face of the franchise, “Broadway” Joe “Willie” Namath. 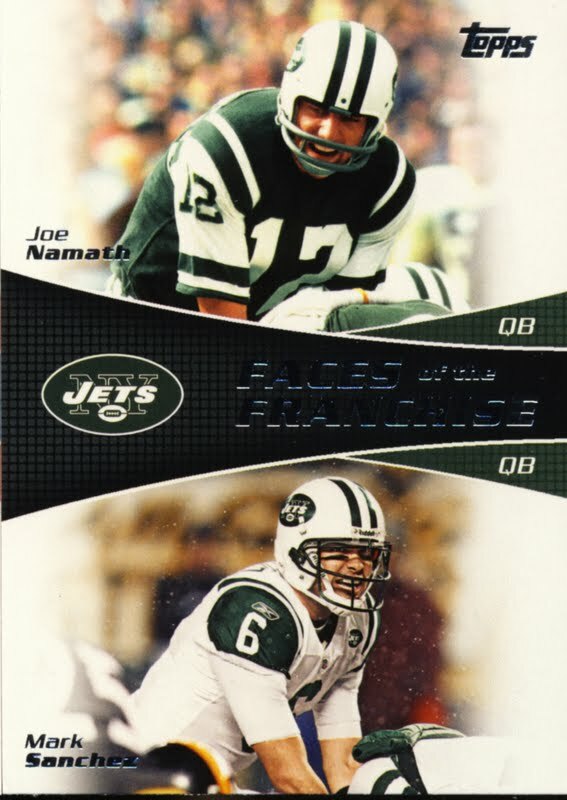 Because Joe Namath’s playing days were before my time, my father, who worked with Namath on his famous pantyhose commercial, would relate to me the importance of Namath to the Jets. For a long time, Namath has been the unofficial spokesman and motivational icon for the Jets. A few years ago I met Namath on an airport security line. He was quite gracious. No... I did not get his autograph that day. I am hoping to unlock one now that the Topps Super Bowl Legends Giveaway site is up and running. A signed Joe Namath card is the big prize on the site. The site and his auto cards will probably be one of the topics of discussion on the Late Show with David Letterman tonight. Namath is scheduled to appear tonight to talk about, amongst other things, his participation with Topps cards this year, much like Hank Aaron did earlier in the year for Topps Baseball. So make sure to tune in or set your DVR for the Late Show on CBS, 11:35 PM East and West Coast, 10:35PM Central. Check your local listings for times in your area. I wonder if Joe will try to kiss Dave. (Just kidding) Love ya Joe!